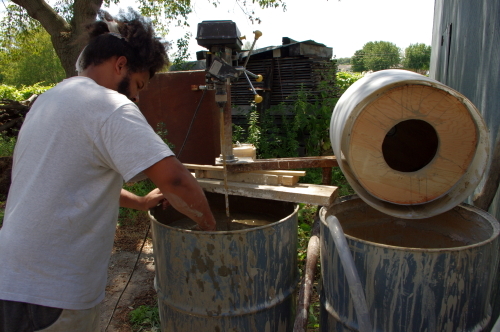 om fills the first barrel of our blunger with raw clay. Mounted to the other side of the swivel arm is our new trommel, a rotating screen to clean the clay. Dom designed it and we made it from a wheel bearing, a drum from a washing machine, half of a plastic barrel, plywood and window screen. It works better with the sump pump than holding a screen in your hands. We also built some more drying troughs by welding the hog panel as the bottom and the sides, rather than framing it in wood. They are less stack-able, but dry the clay faster, and the wood looks like it won’t last long being kept perpetually moist. We have been pulling the clay out of the troughs before it is firm enough to throw because we are so impatient to use it. We’ve been mounding it on a slab of plaster to speed up the drying process and then pugging it in the pug-mill before throwing it. 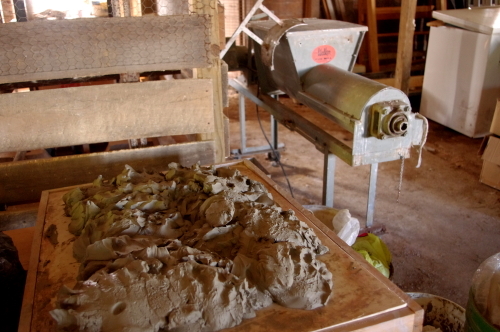 A pug-mill is a little like a sausage maker: an auger grinds the clay and compresses it into a tube of extruded, homogenized clay. 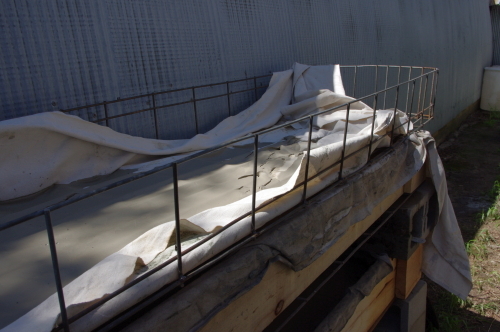 You can see our Walker Pug-mill in the picture on the right.